New makerspaces on college campuses are veering away from traditional classroom learning and providing students with creative and collaborative educational experiences. Cornell University and the Technion-Israel Institute of Technology won, in 2011, the City of New York’s competition to create an Applied Sciences graduate school. In late 2017, the new Cornell Tech campus opened on New York’s Roosevelt Island in a group of buildings uniquely designed for collaboration across disciplines and innovation. 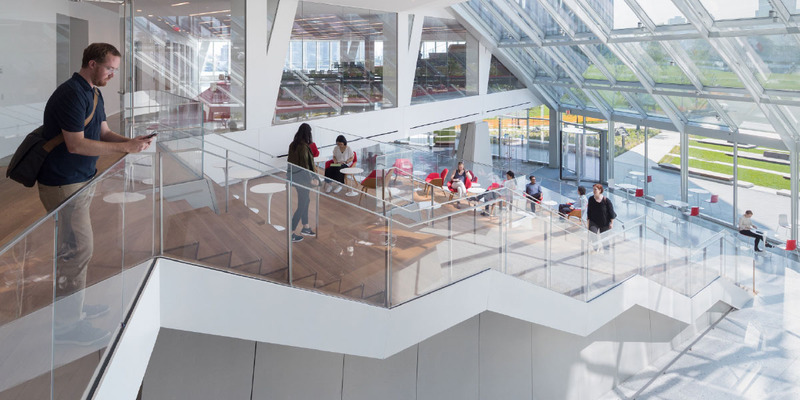 Like Cornell Tech, a growing number of colleges and universities are constructing or retrofitting campus structures that will spur innovative and creative ideas. Some of these business, engineering, and applied learning spaces rival high-tech workplaces, such as the legendary Silicon Valley headquarters of firms such as Google LLC and Facebook Inc. As employers continue to be dissatisfied with graduates’ preparation, students continue to express dissatisfaction with outdated teaching methods. Institutions are working to attract students with edgy ideas, and are moving away from traditional teaching methods and creating live, learn, and play spaces for students, faculty, staff, and alumni. 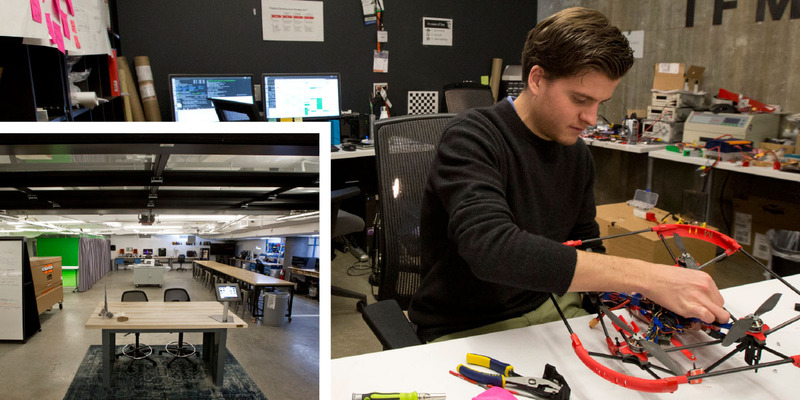 The facilities, also known as “makerspaces,” are collaborative, modern, and entrepreneurial. The rise of makerspaces in higher education started in 2001 at the Massachusetts Institute of Technology, Cambridge, with the creation of Fab Labs—digital fabrication facilities that include digital equipment for designing and creating products. While learners have always experimented and developed, the increase in makerspaces is believed to have started in 2005, with the launch of Make: a bimonthly magazine dedicated to maker-related projects. In 2009, President Obama launched his Educate to Innovate campaign, promoting the value of the creative experience, and spurring the continued development of makerspaces. “I want us all to think about new and creative ways to engage young people in science and engineering, whether it’s science festivals, robotics competitions, fairs that encourage young people to create and build and invent—to be makers of things, not just consumers of things,” Obama said during his 2009 address at a meeting of the National Academy of Sciences. In 2014, the White House hosted its first Maker Faire, and a number of large corporations committed to support similar activities in their own communities, including sponsoring makerspaces at colleges and universities. The experience of making and creating has become increasingly important to employers and the nation’s economic growth—and, in response, institutions of higher education are answering the call by developing spaces where making can happen. Northwestern University, Evanston, Ill., has a long history of turning out entrepreneurs, but until 2015 had no central hub where company founders could meet each other, says Melissa Kaufman, executive director of The Garage at Northwestern. Three years ago, the board of trustees’ Innovation and Entrepreneurship Committee led the development of The Garage, an 11,000-square-foot co-working space located in a campus parking structure. More than 1,000 students, faculty, and staff visit the space each month for classes, office hours, events, and workshops, and The Garage incubates more than 60 student-founded startup companies each quarter. Left: The makerspace at The Garage, the prototyping lab available to residents 24 hours a day, seven days a week. Above: Marc Gyongyosi, founder and CEO of Intelligent Flying Machines, a startup that uses drones to capture warehouse inventory. Focused on entrepreneurship, The Garage didn’t start out as a makerspace. With a background in Silicon Valley, Kaufman says she expected entrepreneurial students to work on software and virtual products rather than physical products. Almost immediately, it became clear that students wanted a makerlab as well as a place to run their own startups, so The Garage turned one of its classrooms into a makerspace and about one-third of the students who visit work on physical products, Kaufman says. In addition to tools and equipment for developing products, The Garage offers students business guidance and a place to find co-collaborators. And the businesses that students are launching and running are finding success. Zcruit. In 2015, a group of Northwestern students started Zcruit, an analytic software that helps collegiate football teams predict which recruits are likely to accept their offers. Two years later, the company was acquired by a larger company, making it the first acquisition of a company incubated at The Garage. BrewBike. When a freshman wanted to open a coffee shop on campus but couldn’t find a suitable space, he took advantage of resources at The Garage to launch BrewBike, a portable coffee shop on the back of his bike. After finding success selling cold-brew coffee on the go around campus, the student and his team opened a pop-up coffee shop in one of the buildings on campus. BrewBike, which earns more than $100,000 annually in revenue, now has plans to expand to other campuses. At the University of Utah, the Lassonde Entrepreneur Institute offers a similar focus on launching student-run companies at Lassonde Studios. Since opening in 2016, the facility has served as home base for a number of successful businesses. For instance, Boundary—a modular backpack, providing simple carry solutions for daily use and travel—was formed by a group of students visiting the institute in January 2017. They designed the new type of backpack, developed prototypes in the institute’s shop, and sought help for locating mills and manufacturers. After a successful crowdfunding campaign, the company has sold $1.5 million in backpacks since last year, D’Ambrosio says. In addition to providing space and mentorship, on a regular basis the Lassonde Institute surrounds student entrepreneurs with experts, such as intellectual property attorneys, e-marketing specialists, and design professionals. “Hours With Experts” are periodic events that host eight to 10 experts for a few hours on a Thursday. “Students can book meetings with them and see as many of the professionals that they need at one time,” D’Ambrosio says. 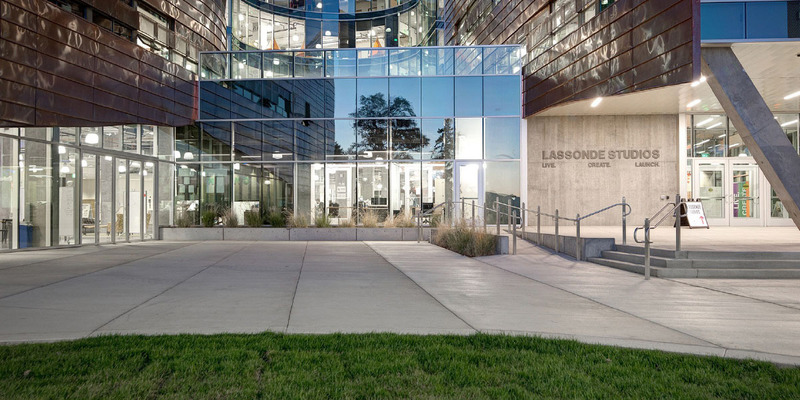 Lassonde Studios is a residential, innovation, and entrepreneurial space at the University of Utah. All students on campus are welcome to “live, create, launch” here. The building combines four floors of housing with a public main level, which features event space, café, makerspace, prototyping tools, startup offices, and more. The building and programs inside are managed by the Lassonde Entrepreneur Institute, an interdisciplinary division of the David Eccles School of Business. Not every makerspace is geared solely toward entrepreneurship. 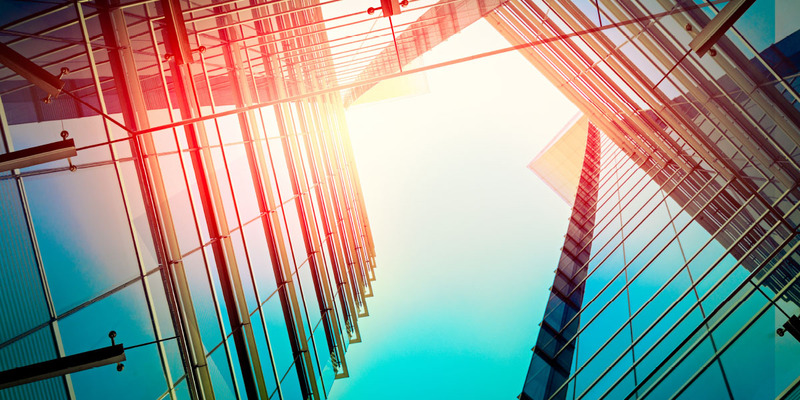 While new businesses are often a byproduct of fresh ideas, innovation itself is an equally important goal. Utah’s Lassonde Studios is “the library for the entrepreneur or tinkerer,” D’Ambrosio says. And the new ideas that take shape there may or may not become seeds for eventual entrepreneurial ventures. Different makerspaces feature different types of tools and equipment, and may add or change offerings based on student preferences. For instance, the MakerLab at Portland Community College (PCC)–Sylvania offers a menu of basic options, including a laser cutter, vinyl cutter, 3D printers, light sheet-metal equipment, light hand tools, soldering, desktop CNC miller, sewing machine, plastic injection molding, and general mold-making material. At PCC’s Sylvania campus, the MakerLab helps “create collaboration among disciplines that wouldn’t normally work together, and that’s when the magic really happens,” says Lisa Avery, Ph.D., campus president. In addition to facilitating multidisciplinary interactions on campus, the MakerLab at PCC–Sylvania also serves to bring more community members onto campus. The space hosts community outreach and donor events, robotic shop camps for middle and high school students, and training programs for local teachers. Last summer, after a group of high school science teachers spent a day in the MakerLab learning how to engage students more fully, they raved about the experience and plan to return this year, Avery says. Starting and running a makerspace is not inexpensive. At Portland Community College’s Sylvania campus, donors supplied the MakerLab with most of the equipment, which helped get it up and running. But to keep the space relevant, the college faces the ongoing costs of maintaining hardware and software, and “we are almost at a point where we need to replace dozens of our computers because they do not run the most current software,” Avery says. Some institutions are finding ways to monetize their makerlabs so that the spaces are self-supportive. The Facility at Edmonds aims to maintain its $2 million worth of equipment by charging fees. Community users taking a composites course will be charged a lab fee, which will go toward their use of the adhesives, chemicals, power tools, and vacuum bagging equipment available in The Facility. After class, users pay a nightly cover charge to use any equipment or items available in The Facility, and they pay a separate hourly fee (charged in 15-minute increments) to use high-end equipment, such as the laser cutter. Interacting with materials, ideas, and other people in a campus makerspace offers transformative educational potential. On some campuses, such as the University of Utah, an array of business courses is offered inside the makerspace, including a track toward receiving an entrepreneurial certificate for nonbusiness students. At PCC–Sylvania, however, no classes meet regularly in the makerspace, but a number of classes, including courses in engineering, architecture, and music, use it for specific projects. Running a makerspace offers real-world experience for many students. At Utah, 25 students, who work in the lab, are responsible for ordering supplies, training users on the equipment, and offering tech support. Beyond the on-campus academic potential for such spaces, the experiences that students have in these facilities offer tremendous value beyond college. Some students create their future careers by building a business in the campus makerspace. For instance, Northwestern alum Marc Gyongyosi, who graduated in May 2017, now works full time in his business IFM (Intelligent Flying Machines), which he launched at The Garage. The company uses autonomous flying robots to better track inventory in warehouses, and has moved from the on-campus incubator to an office in downtown Chicago. But most students who develop products, create new concepts, or even help launch businesses in college will not end up running their own businesses after graduation. However, after their makerspace experiences, they are often more prepared to lead groups, work with teams, and think outside the box—skills that are highly valued by employers. By working with groups outside their own school and with other members of the community, students who utilize the space also build valuable networks. For instance, a senior mechanical engineering major who helped run the makerspace at Lassonde recently met an alumnus who was visiting the building, showed him around, and was hired to work for the alum’s company on the spot. “All the time, we see students getting jobs and making connections through the space,” D’Ambrosio says. After their makerspace experiences, students are often more prepared to lead groups, work with teams, and think outside the box. Find interested faculty. Canvass your campus to find faculty members who may be interested in taking on the makerspace as a project. Interest in these spaces is often great among engineering, fine arts, and business departments, but creating new things is relevant to any discipline, so don’t rule out any particular department. Set aside funding. Even if your lab isn’t fully outfitted from the beginning, you’ll need basic tools and equipment. In many cases, local businesses may be interested in donating equipment, but most institutions can find some internal monies to apply to the project. “Take funds out of the annual facilities budget, the annual faculty development budget, or the annual budget for program assessment,” Narum suggests.